You will learn how to generate free traffic, all by using facebook. You will learn how to find targeted friends fast, creating your own groups, fan pages and much much more. the mark, every single time. In this video we delve further into the Facebook Social Ad Platform and show you how to create and laser target your advertsing for maximum effectiveness. As well as the process involved and what to expect from Facebook itself. In this video we go beyond traditional advertising and go into other ways to maximize your Facebbok exposure, personal and business branding, fan pages, like buttons and joining relevant and targeted groups in your niche and finding partners. These techniques will kick your facebook profits into high gear. You dont want to lose your shirt financially do you ? Of course not. So play close attention to this video as we look at the hidden dangers of facebook advertising and how to avoid the pitfalls with these kick a** tips and techniques. In this video we clear up some of the misconceptions and mistakes when advertising on facebook. Whether it be advertising to broadly, not placing your ads in the right category or modifying them for maximum success. Miss this video and you can blow your advertising budget in no time flat ! 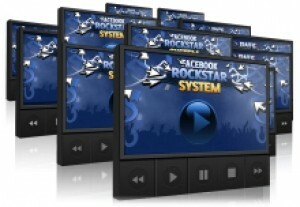 The final video in our series, we wrap thing up with the conclusion of the Facebook Rockstar System. After this video you will be ready to tackle Facebook for both fun and profits.